From trusted pediatrician Dr. Harvey Karp author of the best selling The Happiest Baby & Toddler books comes The Happiest Baby Guide to Great Sleep: Simple Solutions for Kids from Birth to Five Years. This new book offers invaluable tips on how to help your newborn, infant, or toddler get the rest they need, while debunking some of the most widely held myths about babies and sleep. 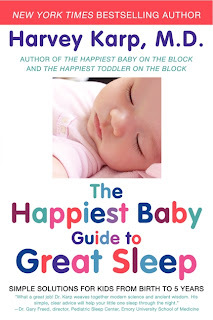 The Happiest Baby Guide to Great Sleep will teach parents things like the best type of white noise (low pitched and rumbling) that is the key to good sleep for all babies, even through teething. Or how to enjoy the benefits - and avoid the risks - of swaddling. One of the most important and surprising lessons taught in this book is that parents should always wake a sleeping baby. This may sound crazy and backwards, but for good sleep, babies must learn how to self-soothe. The best way to teach babies how to fall back to sleep when they rouse in the middle of the night is to gently wake them just as they're being put to bed on a routine basis. Who would've thought? I really enjoyed all of the interesting information and advice that Dr. Karp lays out in this book. I also liked that the book is arranged in sections based on child's age, so after reading Chapter One (a great chapter about the science of sleep), parents can reference the section that applies to their child rather than having to read the entire book at one time. Sections are divided by Birth to 3 months, 3 to 12 months, 1 to 5 years, and then tips for special situations. It's great that even toddler nap time is addressed in this guide. I would highly recommend The Happiest Baby Guide to Great Sleep to parents of young children, or anyone who is expecting or planning to have children in the future. Harvey Karp, M.D., is a nationally celebrated pediatrician, child development specialist, and children's environmental health advocate. He is on the faculty of the USC School of Medicine and a fellow of the American Academy of Pediatrics. Dr. Karp's books and DVDs, The Happiest Baby on the Block, The Happiest Toddler on the Block, and The Happiest Baby Guide to Great Sleep, teach parents breakthrough techniques to reduce infant crying, boost sleep, build toddler patience, and stop tantrums. Millions of parents have benefited from his advice, including celebrities such as Madonna, Michelle Pfeiffer, Larry David, Jewel, and Pierce Brosnan. Disclaimer: I am participating in a book review campaign with One2One Network. I received this book from Harper Collins for the purposes of reviewing it. I have not received compensation. My participation in the campaign enters me into a drawing for a gift card. All opinions stated are my own.